This is a very simple recipe for pan-fried shrimp cooked with a garlic butter sauce. It can be prepared in about seven to ten minutes and turns out surprisingly similar to some of the mass-produced restaurant shrimps you’ve had while you’re out. 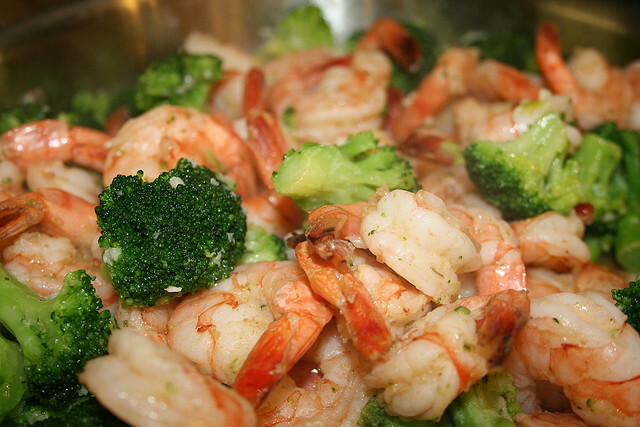 Shrimp is one of those foods that you should buy partially prepared. No one wants to bother de-veining shrimp. So with this recipe it will be assumed you’re using peeled and de-veined shrimp. You’re going to need a bunch of medium sized uncooked shrimp. Put a large skillet on the stove and throw in a quarter cup of butter. Set to medium-high heat. While that’s warming, finely chop two or three garlic cloves. Once the butter has melted and your skillet is reasonably hot, throw in the chopped garlic cloves and one pound of shrimp. Heat until the shrimp turns pink, which should take about five minutes. Now add a bunch of lemon juice. Three or four tablespoons is a safe guideline, but feel free to play with it. It’s your shrimp. Simmer for about two or three more minutes. And you’re done. Serve with rice. Or just eat a whole ton of shrimp. Tell people you got the recipe from Red Lobster. Because that’s more interesting than where you really got it. And this will end up tasting pretty much the same, anyways. I made this for lunch today for my family and they loved it! Thanks for posting! Thank you for this post, How to Cook Hero!